• To and From, if you want us to fill it out for you. SPACE IS LIMITED. See our image on this page. recipients and the receipts in the mail to you. We can also send everything to you if you prefer to send it to the recipient yourself. 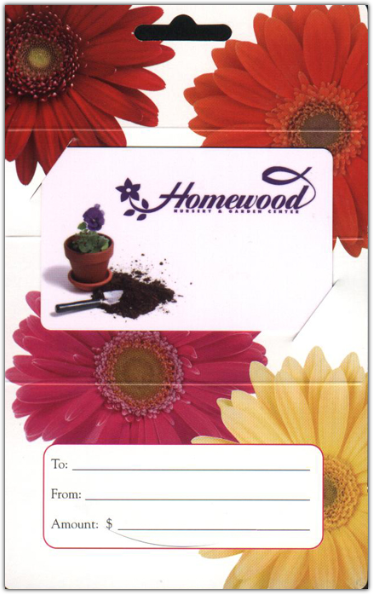 For more information, please call us (919) 847-0117 or email us at info@homewoodnursery.com. NOTE: Email orders received between Friday night and Sunday night will be processed the following Monday. If you need it sooner than that, please call us during store hours and purchase the card over the phone. If you do not receive a quick reply to your email, our Chief of Email Correspondence could be on vacation, in which case, please give us a call and do it the old school way.